If there was an award for unfashionable beer styles, brown ales would be in with a shout for a podium spot. In a world gone mad for hops, there just doesn't seem to be much space right now for the classically malty beers of their ilk. As such, hardly anyone makes them – at least, not in Australia. Yet, as the few that do have proven, when they're good they can be really damn good. It’s into this territory that Stockade wades with its late winter release, the Hoppy Brown Ale. But, as the name should suggest, this is no brown ale of the archetypal English garden variety. Rather, they’ve opted to follow the American mantra of more hops. 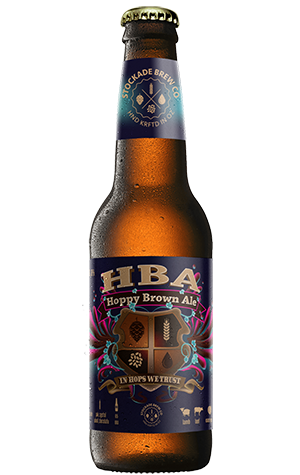 As such, they hurled Columbus, Cascade and Centennial hops at a base that’s full of special, crystal and chocolate malts. The result is what you might call a satisfying in-betweener. Citrus characters dominate the aroma before the malt profile takes over in the form of chocolate, some nuttiness and a touch of brown sugar and a bit of booze before hop bitterness cuts through any lingering sweetness. It’s hard to imagine Stockade’s Hoppy Brown Ale as a beer to outwardly excite the masses because, well, it’s a brown ale. But you can bet your weekly beer allowance there’s a decent sub-section of drinkers out there who’ll be siting with a full glass, quietly nodding their approval.